The Progressive SMB Class–What is it, and Why is it Important? 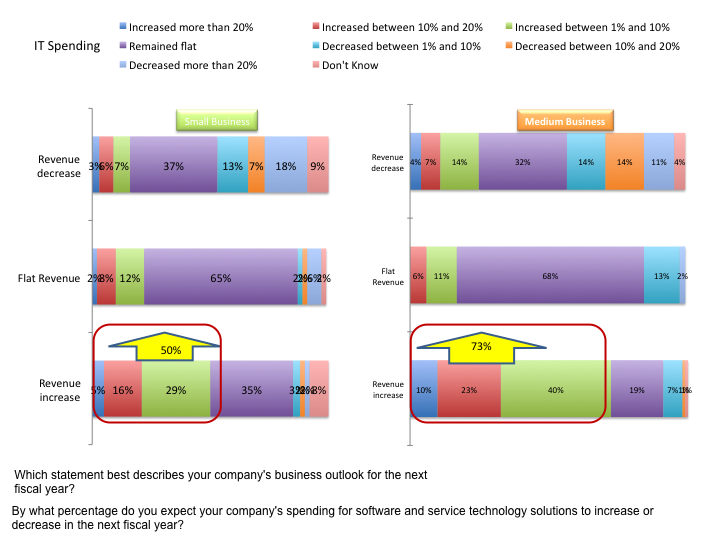 Our 2011 SMB Routes to Market Study indicated that many SMBs are tightening their tech wallets for 2012 as compared to 2011 (Figure 1). But the study also showed a distinct segment of SMBs that we call “Progressive SMBs.” Despite economic uncertainties, Progressive SMBs plan to increase IT investments. They see IT as a tool for business transformation, and a way to create market advantage and level the playing field against bigger companies. Although while price is a factor, they rate other criteria–such as the ability to customize solutions, strong vendor reputation, and local support and service–higher than other SMBs when making technology purchase decisions. Figure 1: SMB IT Spending Plans and Revenue Expectations More important, Progressive SMBs have higher revenues expectations than their peers. For instance, 75% of the Progressive medium businesses (who are increasing technology spending) anticipate revenue gains in 2012, compared to just 17% of medium businesses that plan to decrease IT spending. BigByte and KEEN Footwear have both adopted a Progressive strategy. They illuminate how Progressive SMBs think about IT, and how their businesses have benefitted by making a bigger investment in IT than most of their SMB peers. Good value and no pricing surprises. Soft Engine offered a fixed price for implementation, and fixed monthly price per user, per month pricing for everything else (hosting management, 24×7 support, upgrades, etc.). Fast time to value. As part of the fixed scope implementation BigByte got the software and 21 users up and running in less than 6 months via Softengine’s hosting program for Business One. The ability to customize. BigByte needed to tailor return authorization functionality tailored for each of its customers–and be able to customize for future ones too. Trust in and credibility. Softengine had a strong mix of SAP credentials and competencies, along with managed services and cloud infrastructure design and deployment. Interestingly, although debating what isn’t and isn’t really a “true” cloud solution has become the most popular past time for many of us in the industry, this was not an issue for BigByte. Mike wanted the best ERP solution for BigByte, but didn’t want to manage the IT infrastructure needed to support it. Two years later, Mike says that Business One has given the company what it needs: automated processes and efficiencies; reliable, unified and real-time data; dashboards, tools and reporting for better decision-making. BigByte also uses Business One mobile apps for things such as approving purchase orders. Net-net, Mike estimates the company cut labor costs by about 15%, and cut IT costs by about 80%, because it now outsources hardware maintenance. IT now helps power the business, instead of just supporting it. BigByte can adjust to different customers’ processes and requirements, giving the company the agility to replace shrinking customer demand in the optical disk drive sector with the new customers in the growing LCD market. And, with its business processes in order, BigByte is also much more credible to potential buyers. If you’re an outdoor enthusiast, you know (and probably love) KEEN Footwear, a Portland, Oregon-based footwear designer and distributor. KEEN’s founders went into business to invent sandals that protect the toes with a signature protective “toe bumper.” Today the company offers shoes, bags and socks for many outdoor activities and for casual wear. I had the opportunity to talk to David Boeschenstein, KEEN’s COO about their SAP story. When Dave came to KEEN from Adidas in 2008, the company had outgrown its ERP system. Dave’s charge was to select a scalable solution that could adapt as the company continues to grow. He looked at a few options–including SAP Business All-in-One (BAiO) for apparel and footwear, which is used by several others in the outdoor and specialty footwear sectors. After extensive evaluation involving multiple users from each department, KEEN decided SAP BAiO–along with SAP Business Objects and Business Warehouse–would be the best fit for the company. Now remember, KEEN has only just over 130 employees! But they are another prime example of a Progressive SMB. KEEN views IT as an essential enabler to drive business growth, and wanted solutions that will scale to support the initiatives they have planned for the next 5 years and beyond. According to Dave, Keen’s motivation for installing SAP solutions was “to ensure we provide our customers with excellent service. Our business operations mandate is to make it easy for customers to do business with KEEN wherever in the world they interact with our products and our fans.”. SAP partner Gravity Pro helped KEEN deploy BAiO (using Rapid Deployment Solutions, or RDS), Business Objects and Business Warehouse in July 2011. KEEN is now live in the U.S., Canada, and The Netherlands. Much has already been written about the details of the new products, strategies and solutions that SAP announced at Sapphire, and this is, of course, very valuable to understand. But sometimes not enough is discussed from the customer’s point of view–and some of the most important things–namely the business outcomes from technology–can get lost in translation. The BigByte and KEEN experiences help put the SAP into perspective for SMBs, and illustrate how Progressive SMBs are making their decisions about business solutions. They also highlight why it is so important to be–or become–a Progressive SMB. Hi, I found this article very informative! How long do you think it will take for other SMBs to catch on, if they do at all?